The Wunderkammer Olbricht is on permanent display at me Collectors Room Berlin. The selection and quality of the objects is unique in the world. Comprising over 300 objects from the Renaissance and Baroque periods, it is one of the most important private collections of its kind. 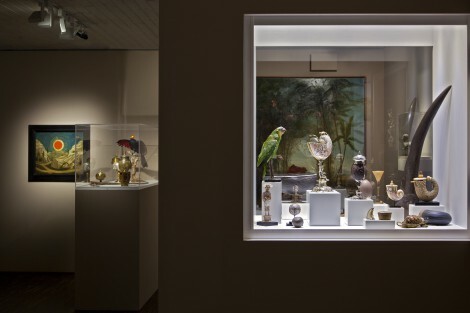 The practice of maintaining ‘cabinets of curiosities’ evolved during the late Renaissance and Baroque periods and represented an important early step in the creation of the institution of the modern museum. Such ‘cabinets’ were private exhibition spaces, where precious artworks (artificialia), rare phenomena of nature (naturalia), scientific instruments (scientifica), objects from strange worlds (exotica) and inexplicable items (mirabilia) were preserved. Today, these collections have much to tell us about the worldview and standard of knowledge of their time. Our Wunderkammer brings this tradition to life anew in two galleries, while also providing insight into the past. Visitors today, much like their predecessors in the 16th to 19th centuries, are amazed by the exquisite curiosities. Whether by the horn of the legendary unicorn, ultimately exposed as the tusk of a narwhal, an amber mirror flooded with light, the coconut cup once owned by Alexander von Humboldt, a preserved great blue turaco, or wooden cabinets that only reveal their mysteries to the curious eye. A list of objects in the Wunderkammer Olbricht can be found here. The Kunstkammer Georg Laue, Munich, is responsible for the conception, installation and management of the Wunderkammer Olbricht.